SM845, hier gevlogen door de voormalig commandant van de Battle of Britain Memorial Flight (BBMF), S/L Ian Smith, in de landing op Duxford. To Indian Air Force as 'HS687' on 311247. Hulk recovered from Kalaikunda AB by Ormond and Wensley Haidon-Baillie, Duxford (1977). To Marshall Moss and Richard A. Boolootian, Lancaster, CA, USA (1978/81). Stored crated at Lancaster Fox Field, CA (1979-1980). To MARC, Chino, CA, USA circa 1981 to 1987. Restoration commenced at Tulsa, OK and later at Casper, WY, USA. Reg. G-BUOS for Park Investments Ltd., Witney on 191092. To HFL, Audrey End for restoration to airworthy status (Raw). Raw at Historic Flying Ltd., Audley End (1992-1996). First flight after restoration from Audley End on 070700 by Charlie Brown. Aircraft offered for sale in 2000 and noted u/c in 0700. In 32 Squadron c/s as 'GZ-J' in 2002. Sold to a subsidiary of Biltema, Norway in the end of 2008. Based at Ängelholm, Sweden. Registration G-BUOS cancelled on 190509. Registered SE-BIN (...). Crashed on 210810 during landing at Tynset, Norway, killing pilot/owner Bertil Gerhardt. Wreck to Airframe Assemblies, Sandown, Isle of Wight in 2012. For Raw. Reregistered G-BUOS on 121112. Wings and fuselage noted with HFL at Duxford in end 2013. 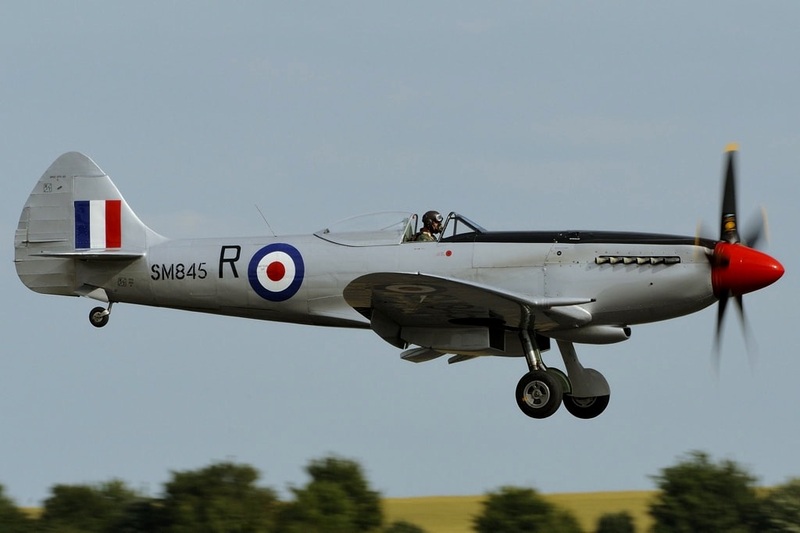 First flight after restoration on 171213 by John Romain. ​Offered for sale in early 2017. ​SM845 is in the c/s of 28 Squadron, RAF Dek Kong in 0750, coded 'R'.